The ease of installation and low cost of electric tankless water heaters make the availability of endless hot water a reality in most any place you enjoy. 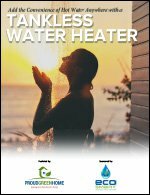 This white paper identifies a few scenarios that would benefit from the convenience of hot water, and provides information to help you find the right size water heater. ECOSMART US® is a privately owned manufacturer of green energy technology based out of Waterbury, Connecticut. ECOSMART’s Mission is to produce and distribute quality green energy products that are practically efficient and economical to consumers. ECOSMART’S main focus and product development is in the area of water heating.